Uli Hoeness has decided to run for Bayern Munich's presidency, seeking to return to a job that he gave up in 2014 after being given a prison sentence for tax evasion. MUNICH (AP) — Uli Hoeness has decided to run for Bayern Munich's presidency, seeking to return to a job that he gave up in 2014 after being given a prison sentence for tax evasion, the Bundesliga champion said Monday. Hoeness, 64, will be a candidate for the job when club members elect the president at their annual general meeting in November, Bayern said. It added that current president Karl Hopfner agreed not to seek re-election in what it termed "very pleasant talks" with Hoeness. Bayern's announcement followed weeks of speculation that Hoeness, one of the most prominent figures in German soccer, would return to the helm at the club. 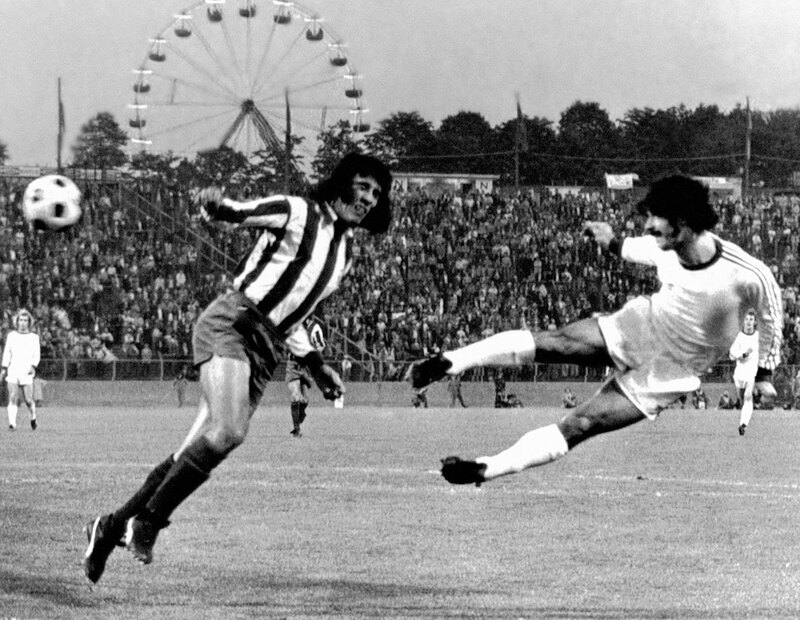 As a player, Hoeness was a Bayern star who won the 1972 European Championship and the 1974 World Cup with West Germany and three straight European Cups—the predecessor of the Champions League—before retiring in 1979 with chronic knee problems. A Munich gymnastics club refuses to let eleven of its members join the German Football Association, so those eleven form Bayern Munich as a standalone football club that same evening. 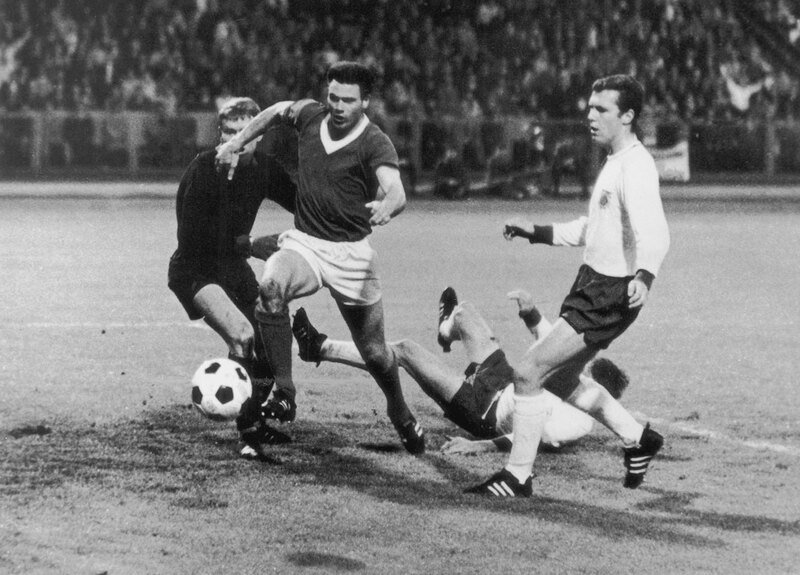 Franz Beckenbauer and Bayern Munich enter the Bundesliga for the first time, having been passed over for the initial collection of teams in favor of 1860 Munich. They win the DFB-Pokal (German Cup) in their first season and finish third in the league. The club captures its first European trophy, winning the 1967 Winner's Cup with an extra-time victory over Glasgow Rangers. Udo Lattek is hired as head coach. 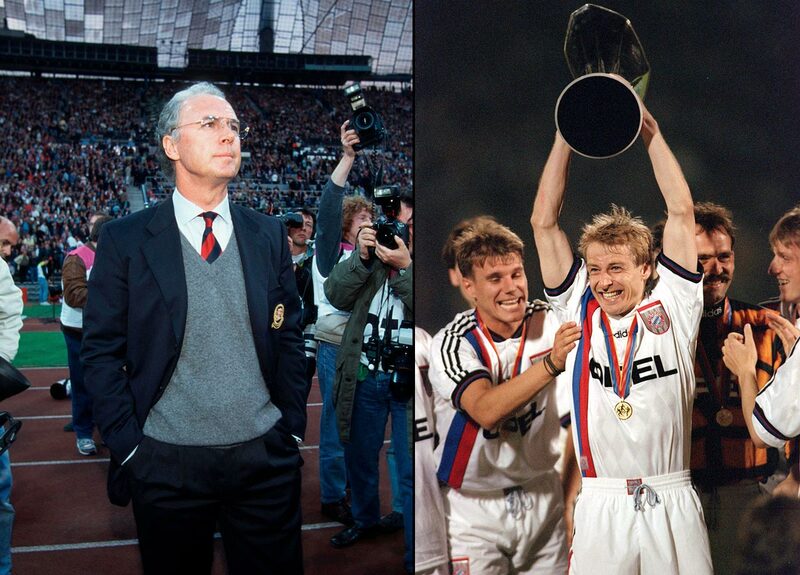 In two different stints in charge of the club, Lattek (seen here in '87) would coach for more days (over 3,000) and win more trophies (10) than any other coach in the club's history. 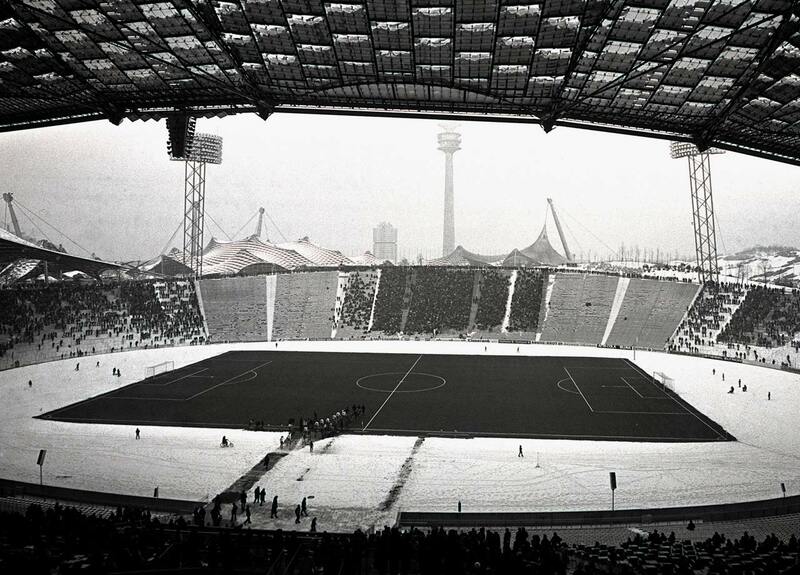 The club moves from the Grunwalder Stadion to the Olympiastadion, which had been built for the 1972 Summer Olympics. It would be Bayern's home for 35 years. Bayern Munich defeats Schalke 5-1 in the first live televised match in Bundesliga history, winning that season's league title as a result. The club wins its first European Cup (now Champions League), 4-0 over Atletico Madrid. It goes on to win the competition the subsequent two years as well. The club signs Karl-Heinz Rummenigge. 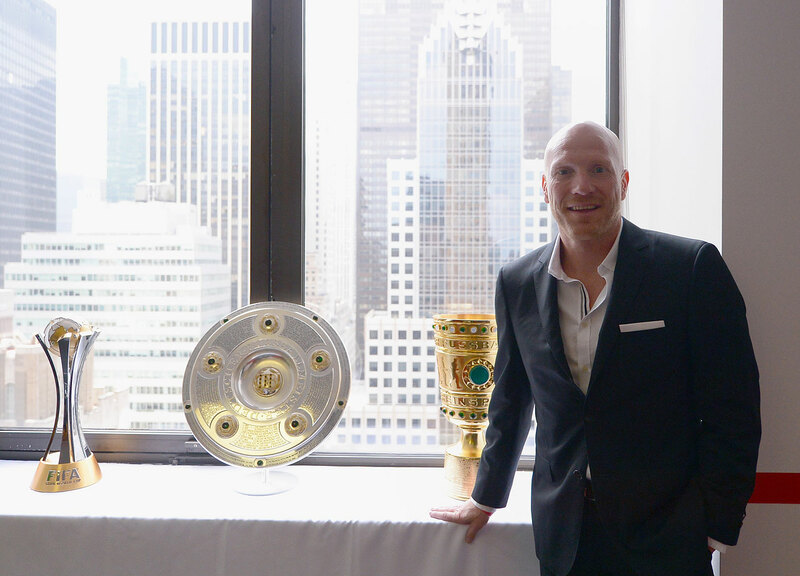 The striker would go on to score 162 goals for the club and is currently the CEO of the corporation that owns Bayern Munich. 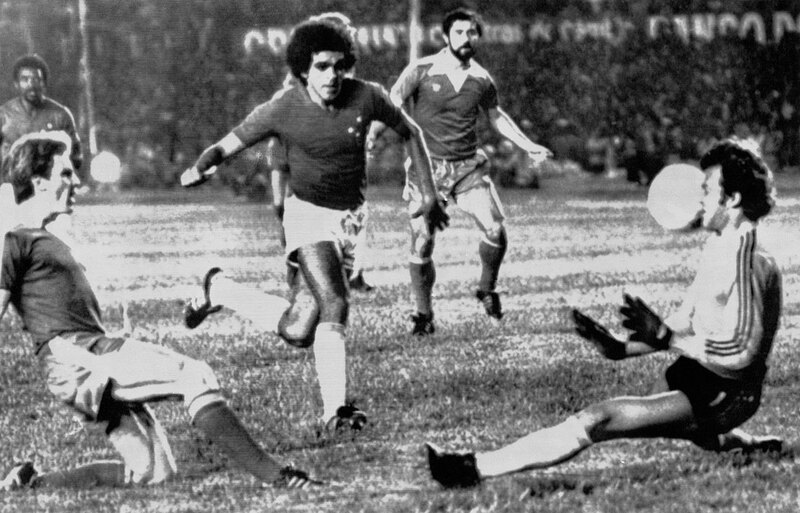 The club wins its first international trophy, defeating Brazilian club Cruzeiro to win the Intercontinental Cup (now abolished). 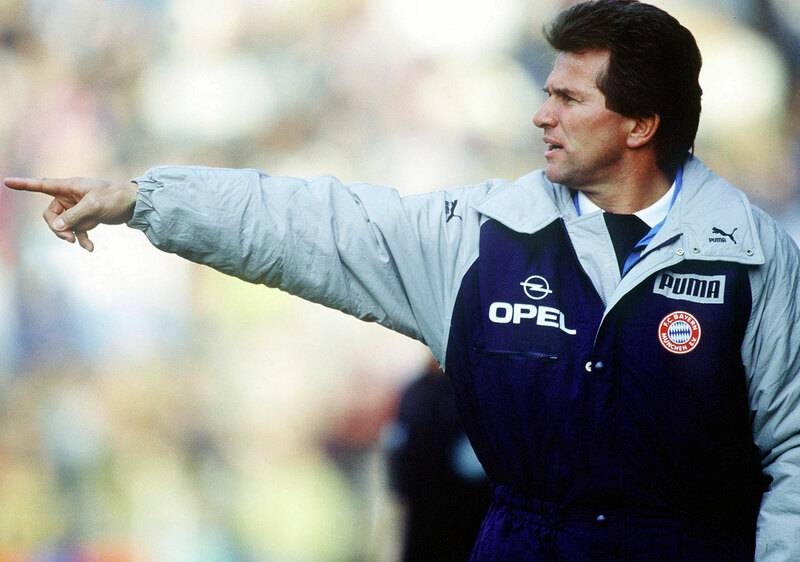 Jupp Heynckes is hired as head coach. 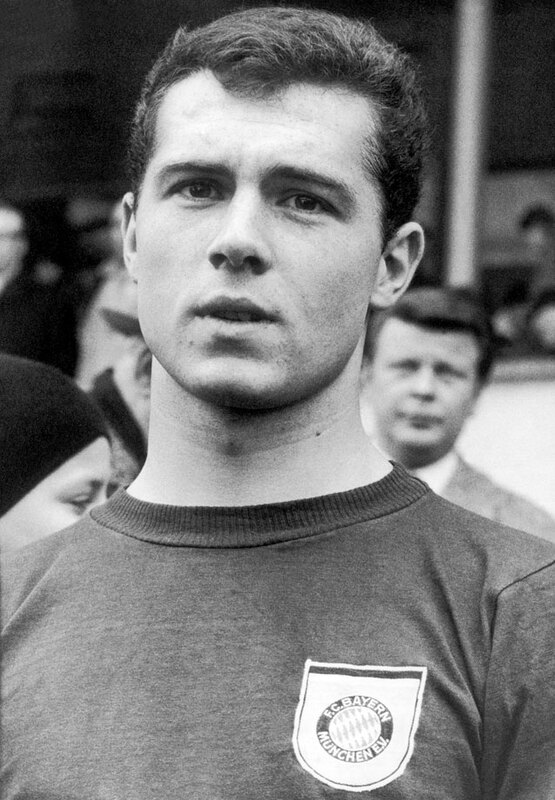 He would win two Bundesligas and two Super Cups. 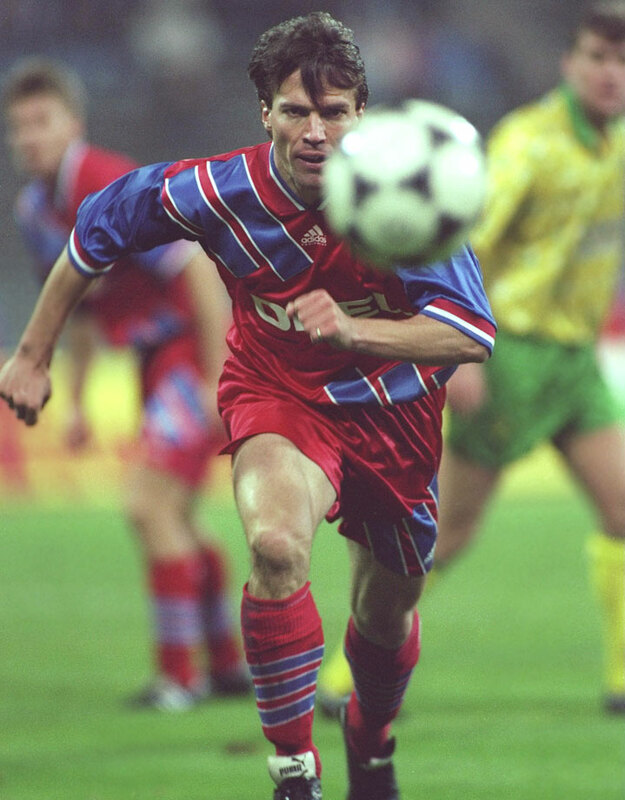 Norwich City defeats Lothar Matthaus and Bayern Munich 2-1 at the Olympiastadion in the UEFA Cup (now Europa League), the only time a British club was able to defeat Bayern at its old home ground. 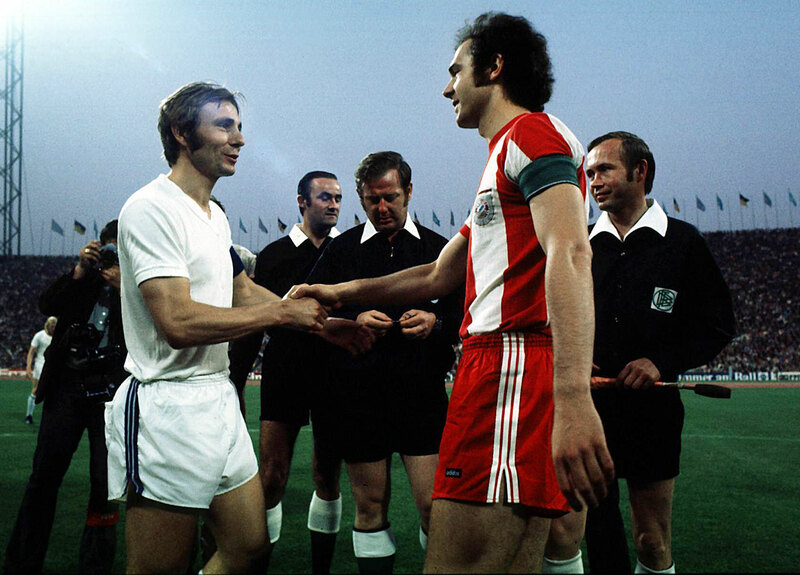 With Franz Beckenbauer as interim manager, Bayern wins the UEFA Cup final against Bordeaux, the only time they have won the competition. 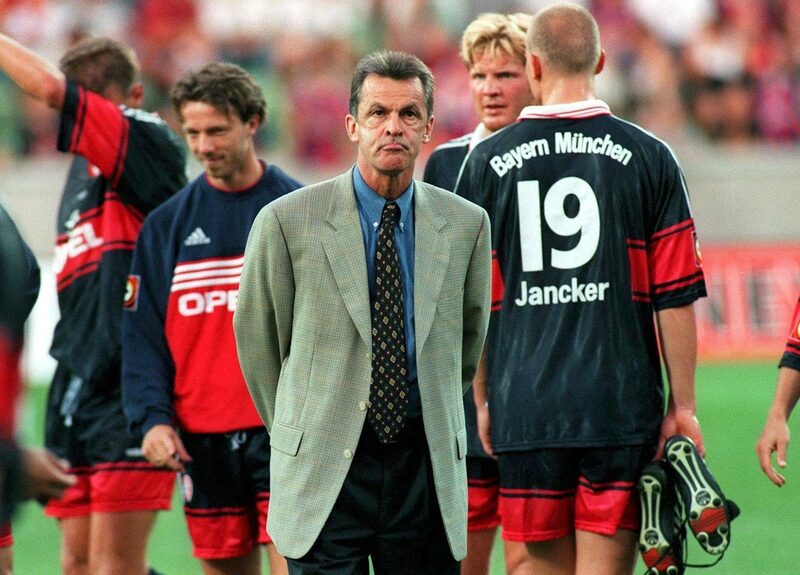 Ottmar Hitzfeld is hired as head coach. He would go on to coach the second-most total games and win the second-most total honors in club history (both behind Uto Lattek). 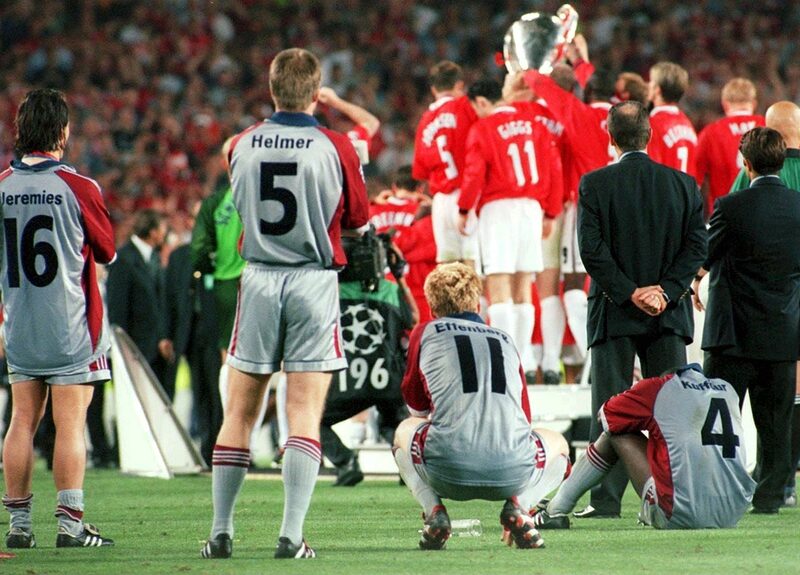 Bayern loses the Champions League final in extra time to Manchester United. Bayern wins its third consecutive Bundesliga title with a stoppage-time goal against Hamburg from Patrik Andersson on a rare free kick from inside the penalty area. Bayern wins the Champions League after defeating Valencia on penalty kicks at the San Siro in Milan, Italy. Bayern wins the Intercontinental Cup in extra time against Boca Juniors, thanks to a goal from Samuel Kuffour. 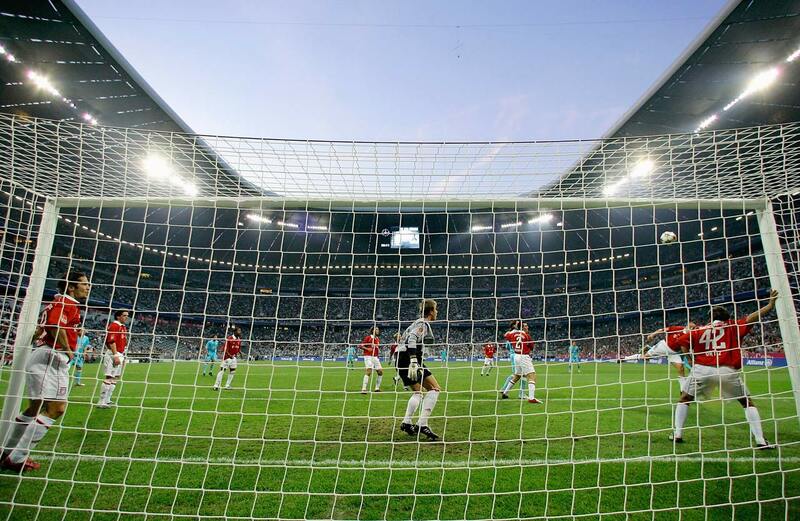 The club moves from the Olympiastadion to the newly-built Allianz Arena, which they share with local rivals 1860 Munich. 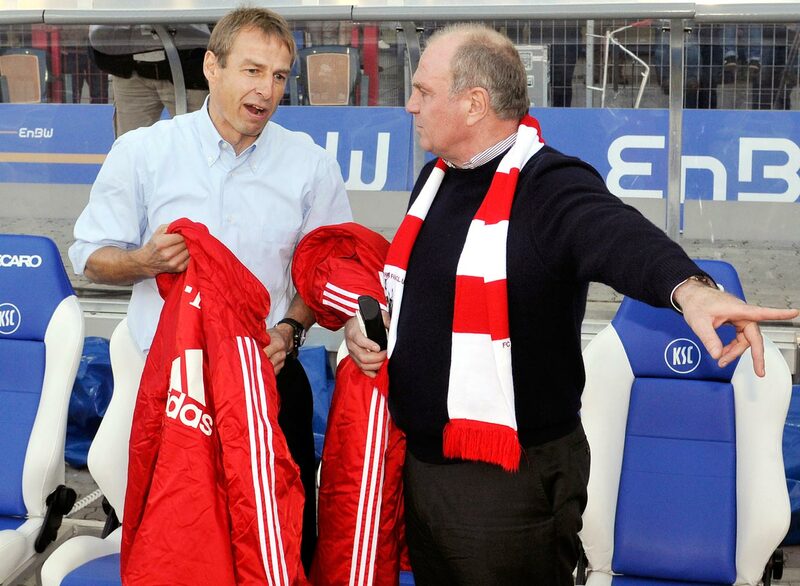 The club hires Jurgen Klinsmann (left) as head coach following his success with the German national team at the 2006 World Cup. He is fired 10 months later. 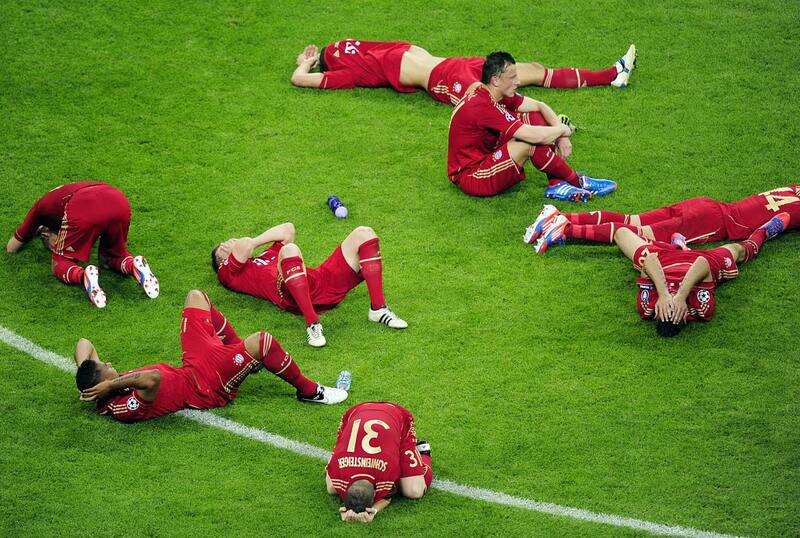 Bayern reaches the final of the Champions League in its home stadium, but loses on penalties to Chelsea. It is the first time the club is defeated by an English team in Munich. 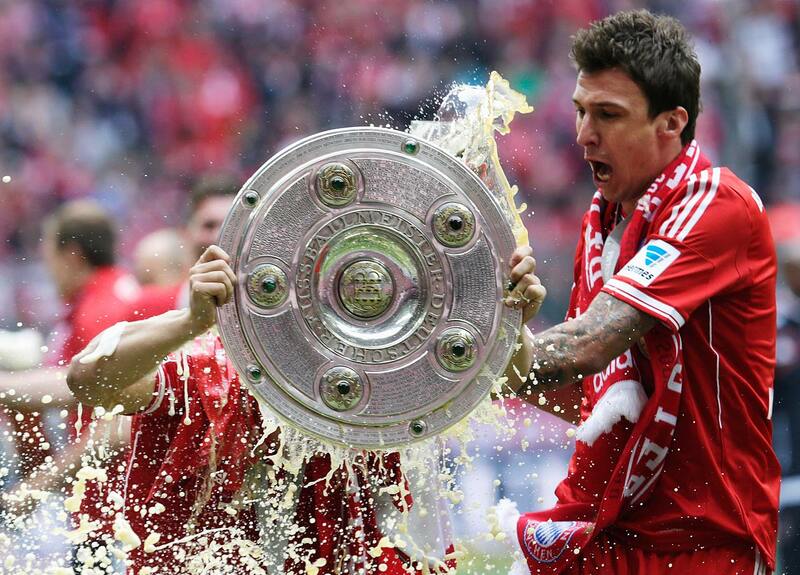 Bayern Munich wins the Bundesliga with six games left, the earliest a champion has ever secured the title. 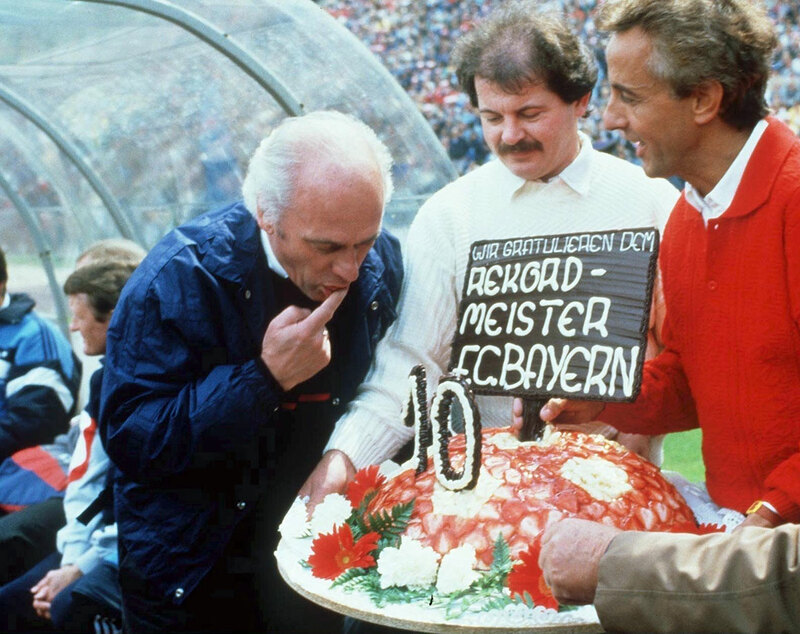 Bayern also sets the record for most points in a season, most wins in a season, and fewest defeats. Bayern wins the Champions League over rivals Borussia Dortmund with a 2-1 win at Wembley Stadium. 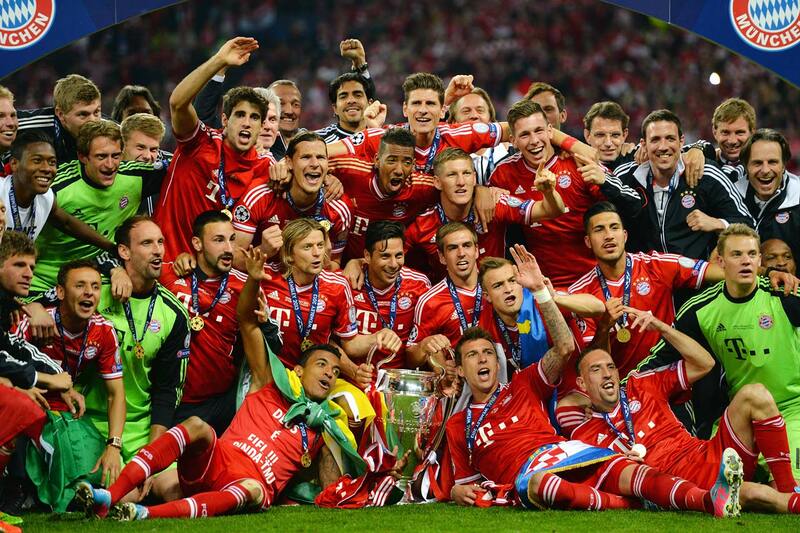 Bayern completes the first treble in German soccer history, winning the DFB-Pokal via a 3-2 triumph over Stuttgart. Bayern ends a Bundesliga record 54-game stretch without losing by falling 1-0 to FC Augsburg. Bayern breaks its own record, securing the Bundesliga title with seven matches remaining. 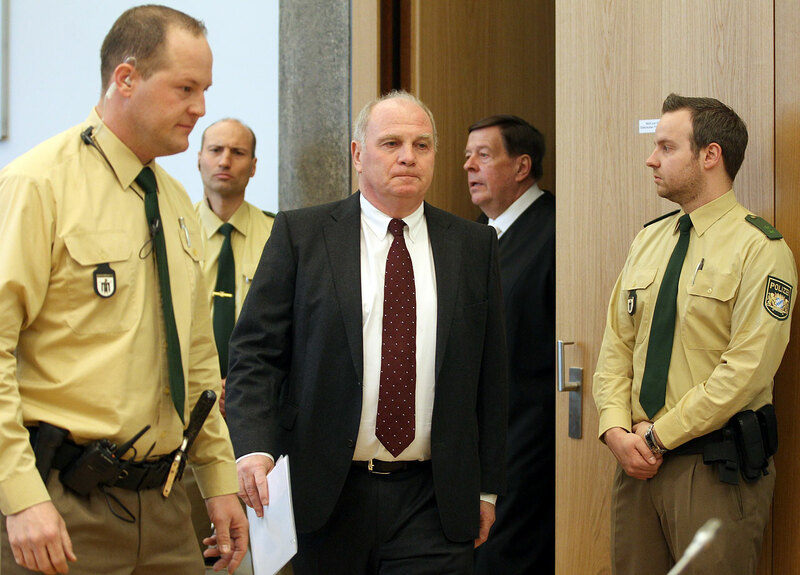 Club president Uli Hoeness, who had reigned since 1979, resigns after being convicted of tax fraud. The club opens offices in the Unites States in an attempt to expand its international reach. Robert Lewandowski holds up all five fingers–one for each goal he scored in a nine-minute span in a memorable 5-1 win over Bundesliga foe Wolfsburg. Hoeness has remained close to the club. While in custody, he benefited from a work-release program under which he worked in Bayern's youth department during the day before returning to prison overnight.